Beautiful real estate in a medieval village in southern Tuscany near the wine routes and spas. 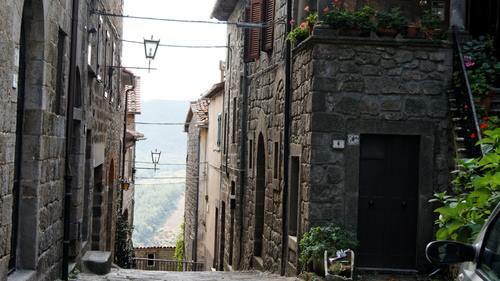 This historic house is located in the center of a quaint medieval village on the slopes of Mount Amiata ( a particularity of the village in the picture above ). It is a very real estate complex consisting of a main body composed of more than ten habitable rooms with bathrooms, a garden of about 300 square meters bordered, on one side, with the palace of the Count Sforza, three additional rooms currently used in garages, several greenhouses and a small private chapel built under the family (whose descendants are still the owners of the property) in 1600-1700. The property includes a garage which is accessed from the main square of the village and that is developed for the entire width and length of the four rooms on the side of the garden. The main building has been full renovated in 1965 with interventions and quality materials, without changing the characteristics of historical – artistic interest of the building. It must be noted then, under the porch that from the living room opens onto the garden, the presence of two marble plaques of historical interest showing the visits to the family by the Grand Duke of Tuscany ; furthermore in the garden there are various statues, busts and other embellishments of particular value. The property is usable as important single family dwelling, but is also suitable, given the square footage meters and accessories, for a division into several units or for a bed and breakfast business. Remember that the village in question is close to the ways of the wine of Maremma ( among which the most important is Montalcino, where is produced the famous wine “ Brunello di Montalcino ” ) as well as to the most important spas in the area, such as Saturnia, Bagno Vignoni, San Filippo. The whole area has many historical sites and offers moments of relaxation. We are the law firm in charge of the sale.